On the day after the tenth anniversary of 9/11, Turki al-Faisal, the former ambassador to the United States of the country that raised and nurtured all but one of the 9/11 hijackers, is threatening Saudi relations with the United States in the event that the US vetoes the unilateral declaration of a 'Palestinian state' in the UN Security Council. How does this two-bit 8th century Kingdom, artificially created by the British 100 years ago, come off threatening the United States of America? Because Barack Hussein Obama is a 97-pound weakling. Even Israeli officials have recently admitted privately to their European counterparts that only Saudi Arabia will be able to give the Palestinians the required religious, political and financial legitimacy they need to complete a deal with Israel. But the Saudis failed to do that in 2000, when Yasser Arafat said he would not be the leader who would give away the Temple Mount. The Saudis failed to back him then. Why would anyone trust them to do so today? Saudi Arabia had earmarked over $2.5 billion in aid to the Palestinian Authority since June 2009, making it by far the largest single supporter of the Palestinian cause. But this money will not do much good until Palestinians are granted their fundamental rights. But most of that money has not reached the 'Palestinians' and it never will. The Saudis talk big, but carry a small stick. 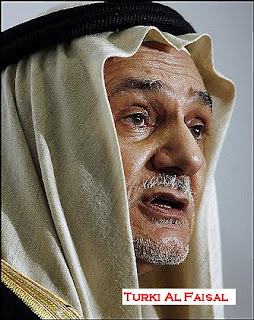 Ten years ago next month, then New York Mayor Rudy Giuliani did the right thing by declining $10 million from al-Faisal's cousin, Saudi Prince Alwaleed bin Talal. Some things ought not to be for sale. American integrity is one of them. Sorry to inform you, but American integrity is for sale. "Moreover, Saudi Arabia would no longer be able to cooperate with America in the same way it historically has." Looks like the saud crime family is not satisfied with the hired help but they shouldn't worry, BHO knows what he's doing. He doesn't simply want to steal Israeli land, he believes he can get Israel to surrender their legitimacy as well. BHO's usefulness is way beyond what his arab bosses expected. They still may not even realize. What kind of 'Palestinian state'?